Snakes and adders are not a game! With the summer upon us, we are urging pet owners to beware the threat of adders after treating a dog which had been bitten by one of the snakes while out for a walk with his owner. Adders, which are the UK’s only native poisonous snake, hibernate over the winter and emerge during the spring, putting dogs at increased risk during the summer months when the weather is generally warmer. Kevin Wood, clinical director at Cherrydown, said: “This is the first adder bite case we have treated at our Basildon practice this year. 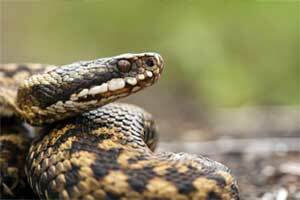 “Adders generally hibernate from October to April, waking up when the weather warms up and they can bask in the sun. Unfortunately, our patient unintentionally stumbled upon an adder while out for a walk and was bitten on one of his front legs. “Adders only tend to bite in self-defence, for instance when they are stepped on accidentally or disturbed by an inquisitive dog, but when they do, bites can be dangerous as they can induce lameness, vomiting and changes to the heart beat, blood pressure and breathing rate. Statistics show most adder bite cases survive, with one study suggesting fewer than one in 20 treated dogs died as a result of a bite.